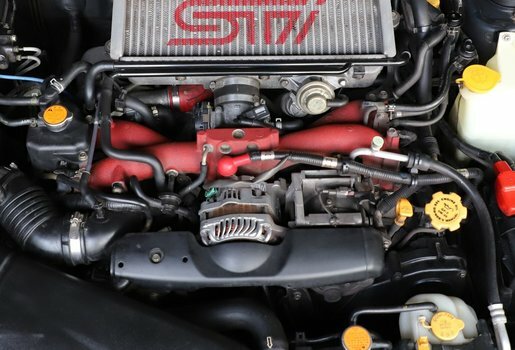 Learn to change the power steering pump on a 2005 Subaru Impreza WRX STI, or just about any Subaru really - they're all so similar. The pump itself is not listed as a serviceable unit, but many reman options are available. 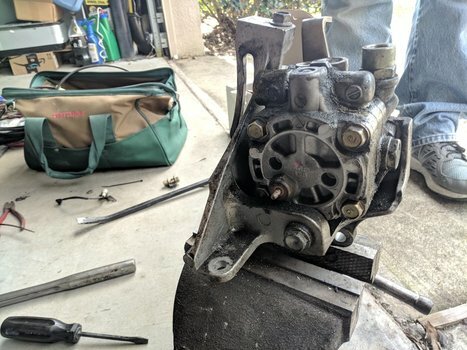 I purchased a reman pump from Autozone and installed it in a few hours. You'll be working near the alternator, so you definitely want to protect yourself here. Theres 2 10mm bolts to remove. Remove cold air the intake tubing. There's 2 more 10mm screws to remove. Just to verify the pump is indeed the culprit, The fluid level in the reservoir should be noticeably low like mine is. 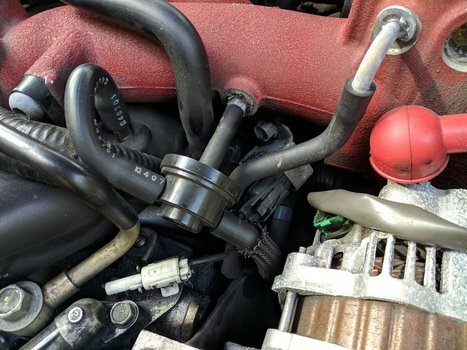 The radiator hose is going to be in the way for most of the job you can remove it however it is possible to change the pump without removing it at all. You'll just have to contort your arms a bit and use a wider variety of extensions. 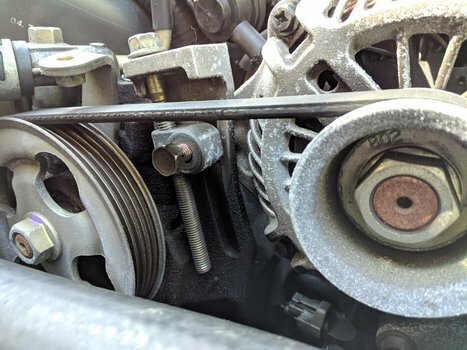 Now that the alternator tensioner is loose, you can push or tap the alternator down to loosen and remove the belt. Disconnect the High Pressure line. The high pressure line is the large banjo bolt attaching the metal tubing on top. Use a 14mm socket to remove this bolt. You may notice my photos show the hoses being removed in a different order from the order used in these instructions. I removed the high pressure hose last, but later realized it would have been slightly better to remove it first. Remove the 2 x 12mm bolts that hold the power steering pump onto the block. 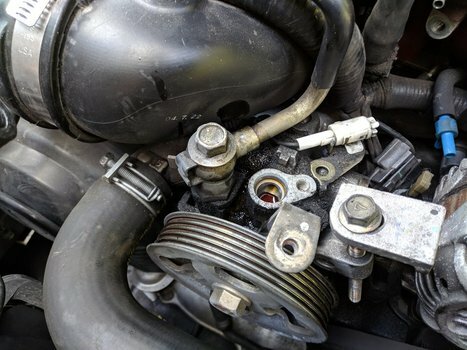 The right one is visible between the ps pump and the alternator. The left one difficult to see, it's tucked right up under the pump bracket just above the timing cover. 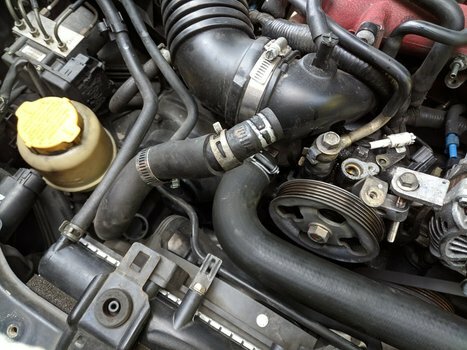 Remove the low pressure hose fitting from the hose and pump. Your new pump may or may not come with a new neck. 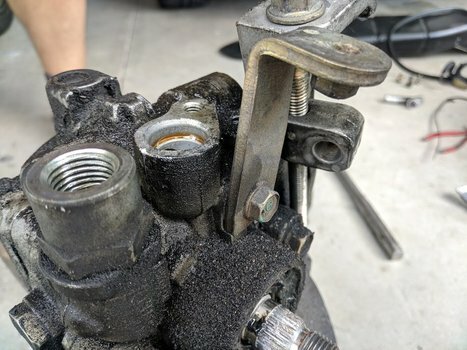 If it doesn't, then don't bother disconnecting the fitting from the hose - just unbolt it from the pump and leave it attached to the hose. 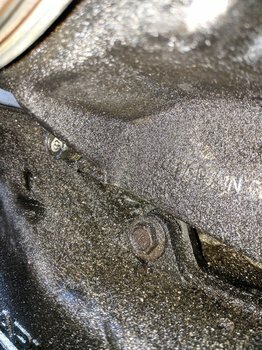 Mine came with a new fitting, so these photos show us removing it. 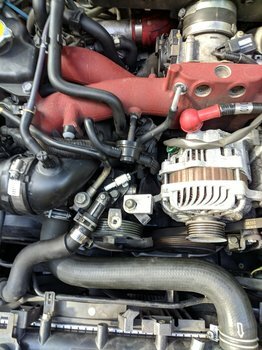 I kept the left side vacuum hose connected and just moved the purge valve out of the way. The right side of the purge valve connects into a 'T' which you should be able to disconnect (shown later). Remove the purge valve solenoid. It's held in with 1 12mm bolt. 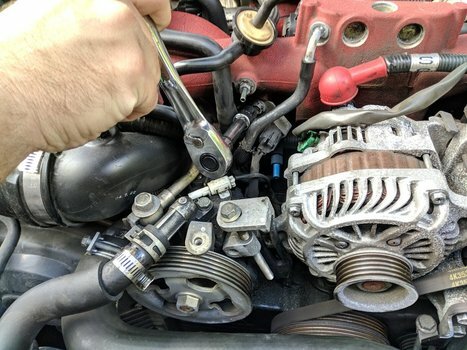 Disconnect the vacuum hoses for the purge solenoid so you can remove it. 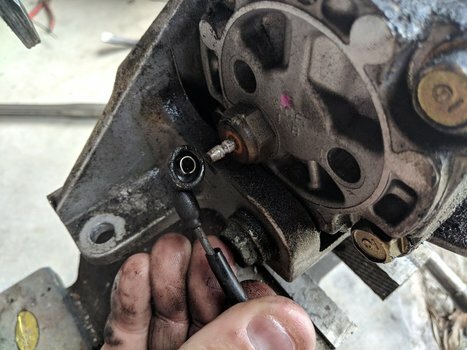 With the purge solenoid out of the way, you can remove the remaining bolt holding the power steering pump in. 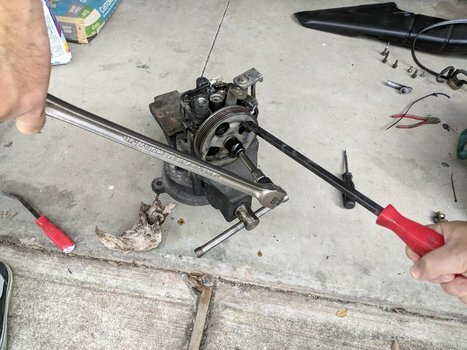 Remove the pump along with it's bracket. Most likely you'll need to remove the pulley from your old pump. Most replacements don't come with one. The nut on the pulley uses a 19mm socket. 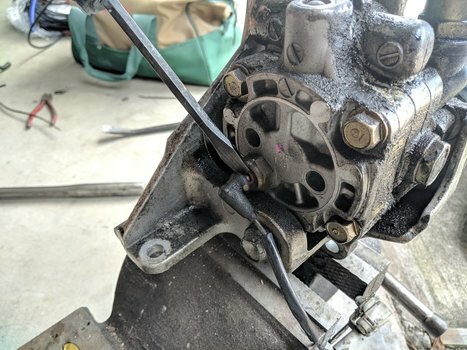 To remove it, You'll need either an impact gun or a vice, breaker bar, and a pry bar. 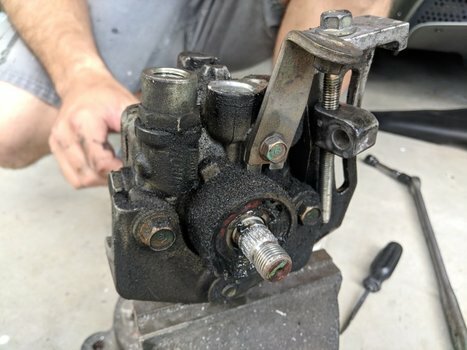 We used a vice. Take care mounting the bracket in the vice - don't chew up the bracket by making sure it's mounted square and solid. I needed to use a pry bar to keep the pulley from turning - again, use good judgement for what you're prying against. This job would clearly be better with an impact gun. 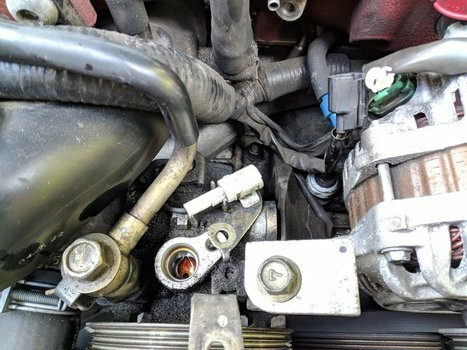 Disconnect the power steering pressure switch. Remove the bracket for the belt cover. I believe this was a 10mm. Remove the 2 x 12mm front bracket mounting bolts. Remove the 12mm rear bracket mounting bolt. 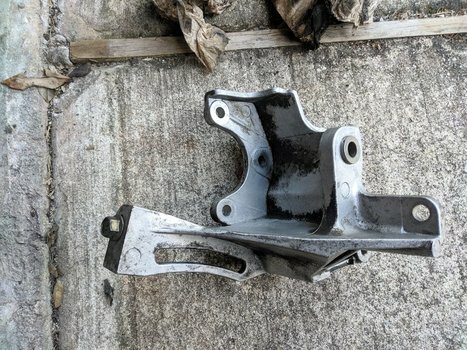 Remove the pump from the bracket. 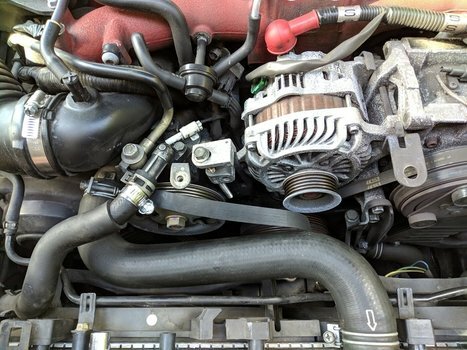 Subaru doesn't treat the power steering pump as a serviceable unit, so we don't have torque specs for many of the fasteners. Install the rear 12mm mounting bolt. It's the long one. Install the little 'L' bracket to the front of the pump with 1 10mm bolt. Install the front pulley and bolt. 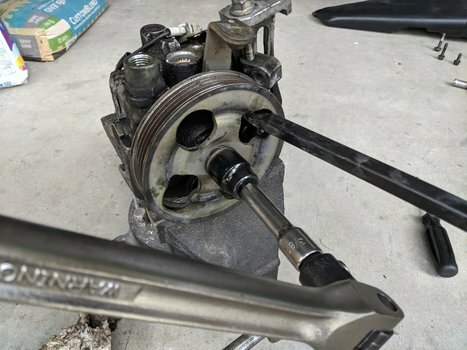 Torque to pretty darn tight. 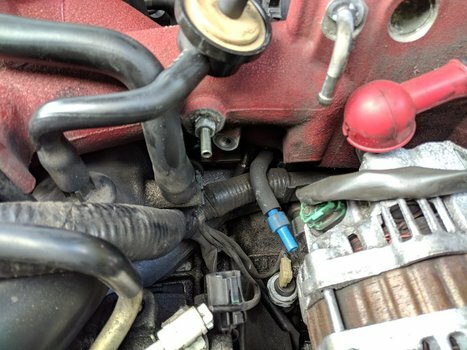 Install the pump and bracket into the car. Replacing the 2 front bolts and 1 rear bolt. The longest bolt goes in the front right hole. Install the high pressure hose. It's the 14mm banjo bolt. If your pump came with new crush washers, use them. If not, make sure you use the one that came off the old pump. Install the low pressure hose. Clip the pressure sensor connector together. Install the purge solenoid and purge valve. All the little vacuum hoses can be a treat. 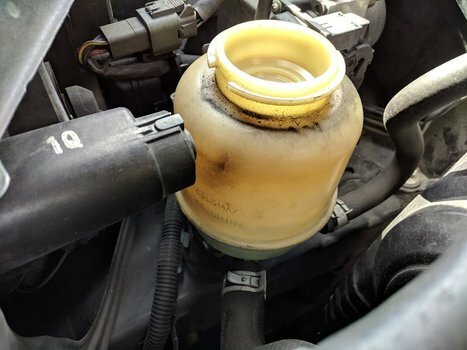 Take care not to crack any of the hoses, and replace them as needed. Test the pump and belt tension by starting the car and turning the wheels side to side. Check for any visible leaks or drips. Refill the power steering fluid reservoir as needed. 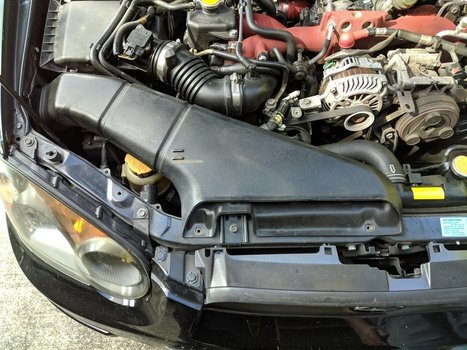 Finish by installing the intake tubing and belt cover. 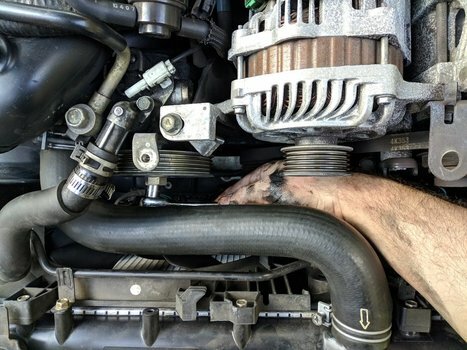 The steering rack and pump may behave a little strange after you change the pump. Mine took about 20 minutes of driving to really work out all the air so that it felt normal. I noticed it most prominently taking a long slow arcing off-ramp. The steering would sporadically get hard then soft. The smell of burning the remaining steering fluid subsided after a couple drives. As a result, it's probably wise that you drive the car for it's test run rather than just bolting it up and sending your family on their way.